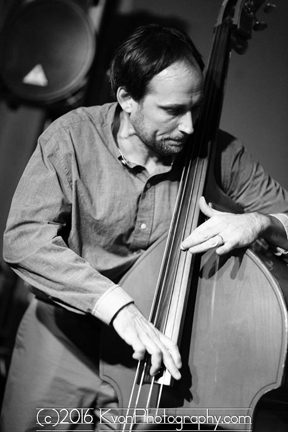 The Paul Shanley Group plays Best Video Performance Space on Thursday, Jan. 31. The show starts at 8 PM and the cover is $5. The Paul Shanley Quintet seeks to bring fresh perspectives to a wide range of jazz styles from Cole Porter to Thelonious Monk. The goal of our music is to create something in the moment that is unique, exciting, and played with energy and passion. Everyone in the group has their own thoughts and feelings about the music and how they like to play, then we come together through our common interests. Playing live is an essential part of the music and the instant response that we get is the largest reward. Nothing comes close to the experience of listening to great live music. This group will do everything in our power to create a great performance for you the listener. 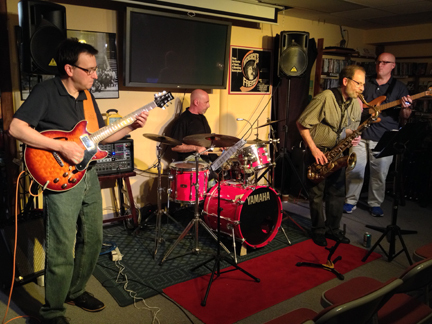 The Tony Purrone Trio plays Best Video Performance Space Wednesday, Dec. 19. The show starts at 8 PM and the cover is $10. Legendary jazz guitar virtuoso Tony Purrone will present an evening of electrifying original jazz and some rearrangements of jazz standards. 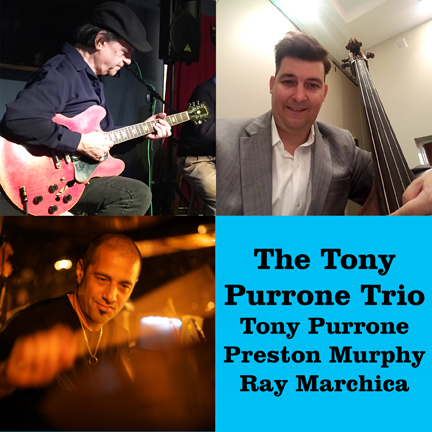 Purrone will be accompanied by Preston Murphy (upright bass) and Ray Marchica (drums). Tony Purrone was born and raised in Connecticut. His love affair with the guitar started with his first lesson at age nine. This early ability, expressed across a diversity of styles, led to acceptance by the University of Bridgeport Jazz Ensemble at a very young age. Four years later, whilst still a student, he performed with the Don Elliott Quintet and the Gerry Mulligan Sextet. After transferring to New York University, Tony graduated with a BSc in music. In 1982, Tony left to carve his own impressive niche in the eclectic jazz world. He has performed with a Who’s Who of Jazz, including: Frank Foster and the Count Basie Band, Jerome Richardson, Lee Konitz, Al Cohn, Pepper Adams, Paquito D’Rivera, Sal Nistico, Nick Brignola, Bill Barron, Dave Leibman, Freddie Hubbard, Dizzy Gillespie, Randy Brecker, Lew Soloff, Jon Faddis, Donald Byrd, Lionel Hampton, Woody Herman band members, the Jimmy Heath Big Band, Stanley Cowell, Billy Eckstine, Johnny Hartman, the Trio (3) with Pete Levin and Lenny White, and his own groups. 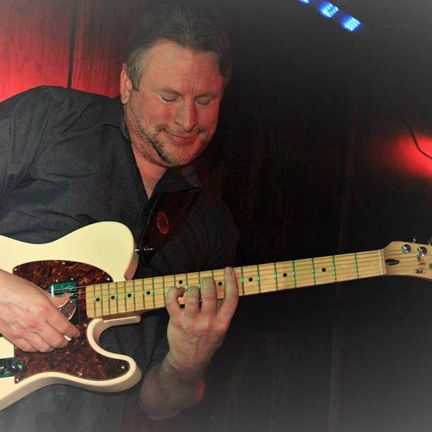 Tony has taught music at Housatonic College and Wesleyan University in Connecticut and at Queens College in New York. Tony participated in two Grammy nominated albums, “Heath Brothers Live at the Public Theater”, (1980); and “Jimmy Heath-Little Man, Big Band” (1994). Tony has also recorded with Jimmy Heath on the Landmark, Verve, and Steeplechase labels, Ed Thigpen on the Reaction label and is the featured guitar soloist along with bassist, Stanley Clarke, on the song “Dark” co-written with Lenny White on Lenny’s CD, “Present Tense” (Hip Bop records). 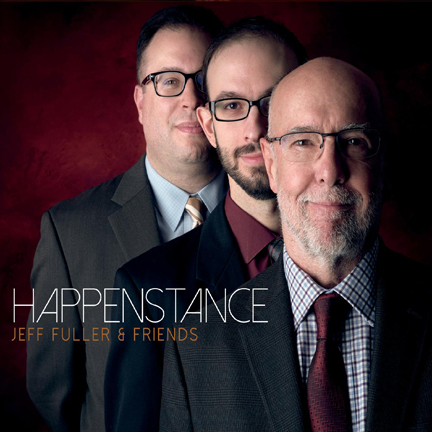 On this album, happenstance means a blending of improvisation and composition resulting in some truly great moments of both planned inspiration and spontaneous coincidence. The musical language of each player has merged ever closer on this, the group’s third album since 2014. Totally tuned in to each other’s thoughts, we are comfortable and at ease with the joyful and intense process of creating challenging music together. Jeff Fuller & Friends is made up of Jeff Fuller on bass, Darren Litzie on piano, and Ben Bilello on drums. The classic jazz trio format gives rise to—and makes room for—many delightful moments of serendipitous exchange. In no small part this is due to listening—each member of the trio evidently hears the conversation as a whole while adding their own thoughts to the process. The result is an emotional, intelligent and lucid story that carries through from the first note to the last. The songs are a mixture of original compositions by Jeff and Darren, as well as a couple of standards re-arranged in the trio’s unique style. “Happenstance,” the title tune, is offered twice: in a new instrumental version (it was included in the 2014 release “The Call From Within”), and in a vocal version featuring Connecticut’s outstanding young jazz vocalist, Atla DeChamplain, interpreting the fresh lyrics by vocalist Ellynne Rey. Darren Litzie offers “Nice Try” which features drummer Ben Bilello, and a remarkable update of “Cry Me A River.” Fuller’s newest compositions include “Will O’The Wisp,” the beautiful ballad “See The Light,” and the powerful samba “Manhã de Primavera.” The beboppish “Upside Down” is one of his older compositions (1992). A solo piano version of “Scorpio” is dedicated to Fuller’s mother, who was, of course, a Scorpio. When you throw in an Afro-Cuban version of Jerome Kern’s “All The Things You Are,” Fuller’s folksy “Grandstand” and the Brazilian “SambaNova,” you have a marvelous mixture of melodies, harmonies and rhythms—a potent setting for true improvisational happenstance. 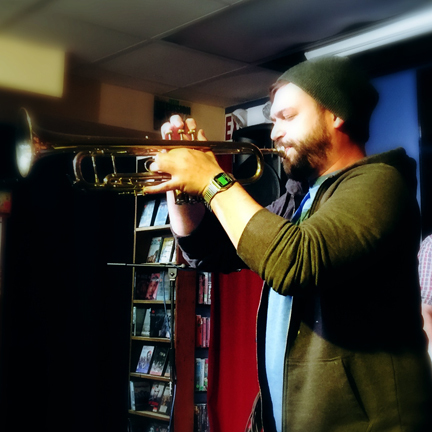 Trumpeter Nick Di Maria brings his electric group WiRED to Best Video Performance Space on Thursday, Oct. 18, at 8 PM. The cover is $5. 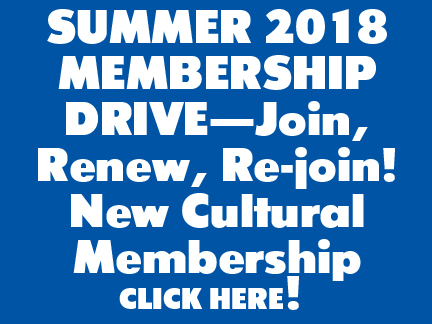 Nick Di Maria is a trumpeter, composer, bandleader, educator and community activist based in New Haven, CT. A graduate of the WCSU school of music and student of Dr. Eddie Henderson. Nick has performed across the country in various bands and musical projects including the New Haven Jazz Festival, Warped Tour, NYC jazz clubs and more. “Mr. Millennial’s Revenge” is a collection of new compositions written for Di Maria’s electric quintet WiRED. Influenced by the the careers and music of Miles Davis and Herbie Hancock during the 1970’s, Di Maria has written a brand new set of music that pays homage to the heavily groove oriented music of these masters with an autobiographical perspective of growing up between the 1980’s and 1990’s while coming of age in in the early 2000’s. The music of “Mr. Millennial’s Revenge” is honest, defiant, and absolutely raw. The jazz quartet BadSlax plays Best Video Performance Space on Friday, Oct. 5. The music starts at 8 PM and the cover is $5. 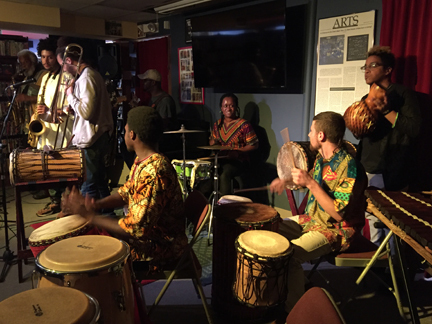 The Lost Tribe, led by percussionist Jocelyn Pleasant, plays Best Video Performance Space on Friday, Sept. 28. The music starts at 8 PM and the cover is $10. 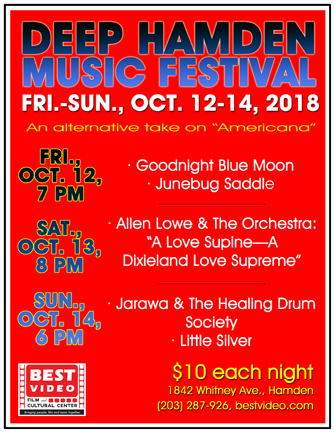 Based in Middletown, CT, this high energy band performs music rooted in West African tradition, while incorporating funk, reggae, jazz and other styles. Organized by percussionist Jocelyn Pleasant, the group includes Seny Tatchol Camara, Matt Belliveau, Joel Hewitt, Nathan Davis, Karim Rome, and Richard III McGhee. 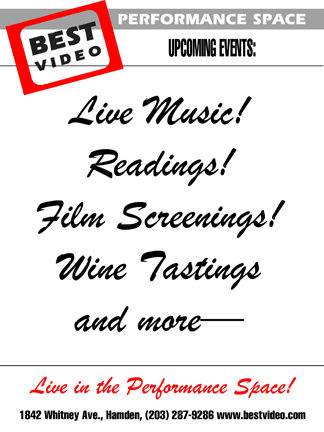 Jazzphoria plays Best Video Performance Space on Friday, Sept. 21. The show starts at 8 PM and the cover is $5. The group is Clifford Schloss (bass), Mathew Mueller (piano), Logan Sidle (drums), Miles Singer (tenor sax), Kenny Georges (alto sax) and Ryan Peter Murphy (voice). 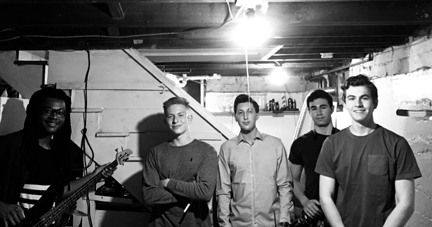 Jazzphoria is a Hamden-based group composed of high school and college students. 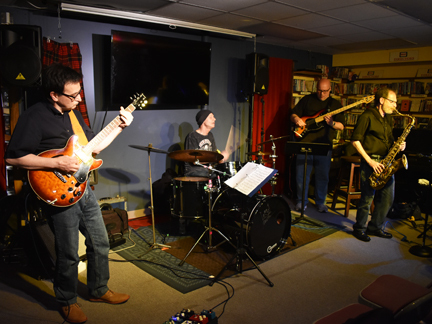 Some of the group’s members make up the jazz combo at Hamden High, but Jazzphoria has the additions of Ryan, who will be attending Berklee School of Music, and Clifford, a current teacher at the Neighborhood Music School in New Haven. They play a lot of big band style music and jazz standards, but play much more than “traditional” jazz. Other genres they cover include funk, pop, classic rock, and gospel. They play mainly covers, and often take very popular melodies and adapt them to our own group. Influences include Duke Ellington, Stevie Wonder, The Beatles, Wayne Shorter, and Earth Wind and Fire, but they strive for their own unique and independent sound.